There are many ways TalentClick can customize and integrate with your processes and platforms. Whether you want to automate, integrate, or develop an assessment or report, TalentClick can accommodate all your workforce assessment data in one secure place*. Contact us for more details. Do you have your own evaluation content? TalentClick can help you develop the content into an automated assessment and deliver it for you online. Do you have an Applicant tracking system or HRIS? You can integrate TalentClick into your system with the TalentClick API. Do you have Corporate Values that make you stand out from others in your industry? Are you looking for a ‘white labeled’ solution with your logo? 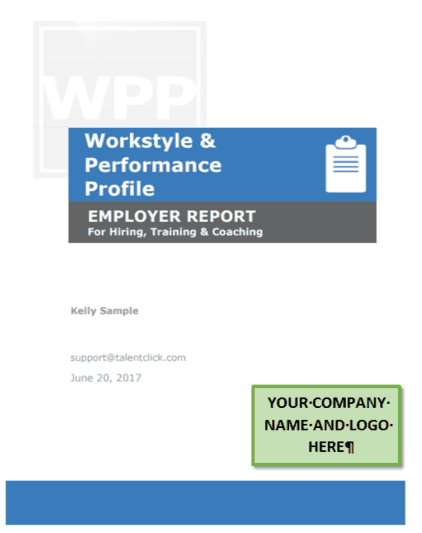 TalentClick can build custom reports with your branding, corporate values or core competencies to help guide you towards making better hiring decisions when it comes to person-organization fit.